While Priyanka Chopra and Nick Jonas are celebrating their nuptials in Rajasthan, there’s another married couple from Bollywood who are still on party mode. Lovebirds Deepika Padukone and Ranveer Singh are happy and they want the world to know it, one decadent bash after another. 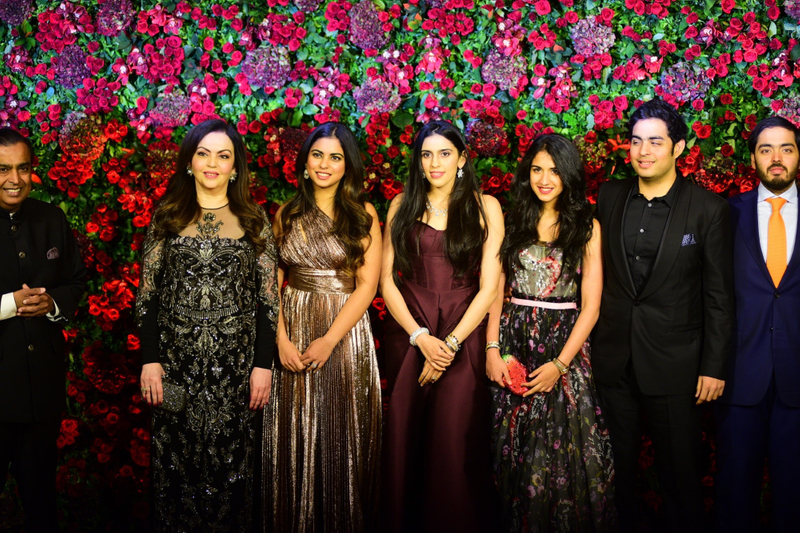 Their gig on Saturday evening was a star-studded affair as a galaxy of Bollywood talents partied the night away with the newly-married couple at Grand Hyatt in Mumbai. But before the party started, Singh and Padukone took to their social media accounts to post flawless pictures before they greeted their glamorous friends from the entertainment industry. 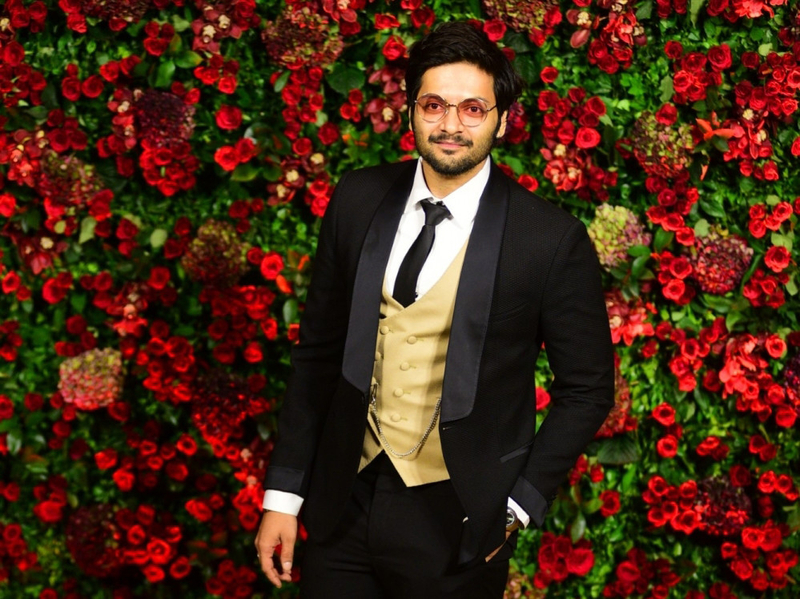 While Padukone was in a glittering red Zuhair Murad gown with a red veil covering her face, Singh wore a tuxedo with a bow tie designed by Indian designesr Rahul Khanna and Rohit Gandhi. 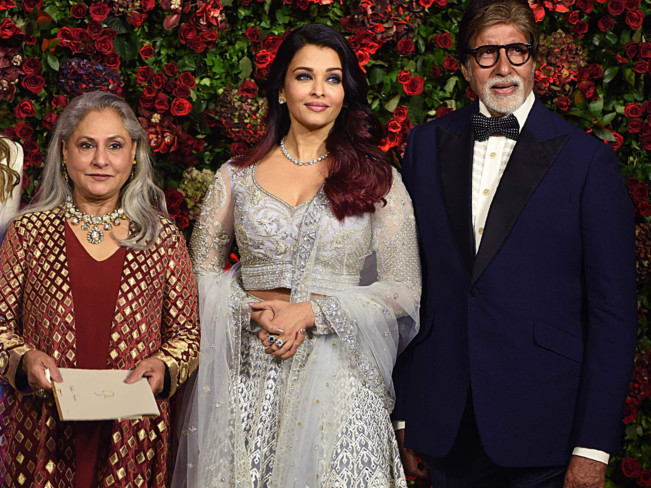 Both made a fetching portrait as they posed in a picture-perfect manner just before they set out to meet their Bollywood colleagues, who weren’t a part of their intimate wedding in Italy’s Lake Como earlier this week. 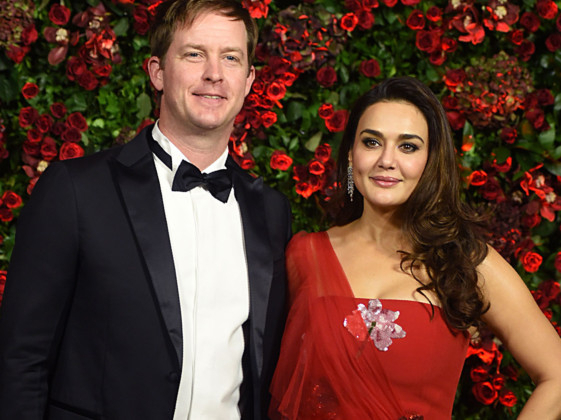 But the couple seems to be eager to make up for the lack of Bollywood contingent. Padukone and Singh, who returned from Italy, have been busy throwing post-wedding parties across India including Bengaluru and Mumbai. 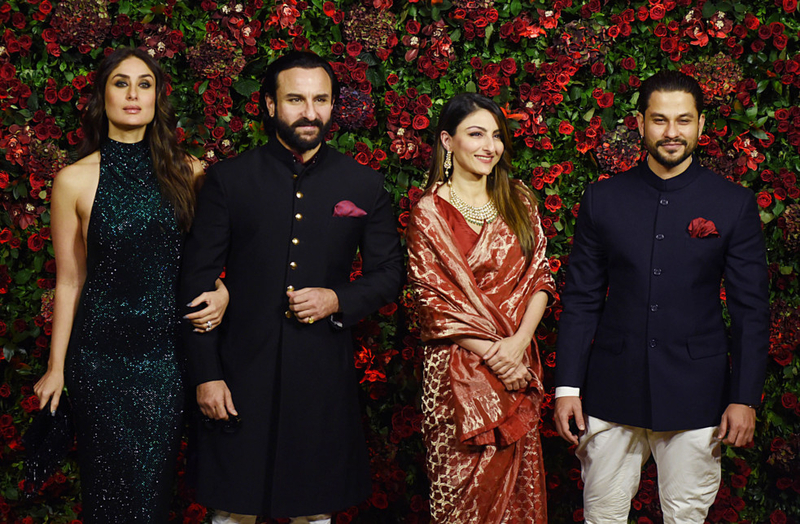 While the Bengaluru reception was a family-centric affair, the one in Mumbai on Saturday was a glitzy affair with all the major Indian stars in attendance. Actors including Shah Rukh Khan, Farhan Akhtar, Radhika Apte, Jahnvi Kapoor, Vidya Balan and Hema Malini were a part of the celebrations. 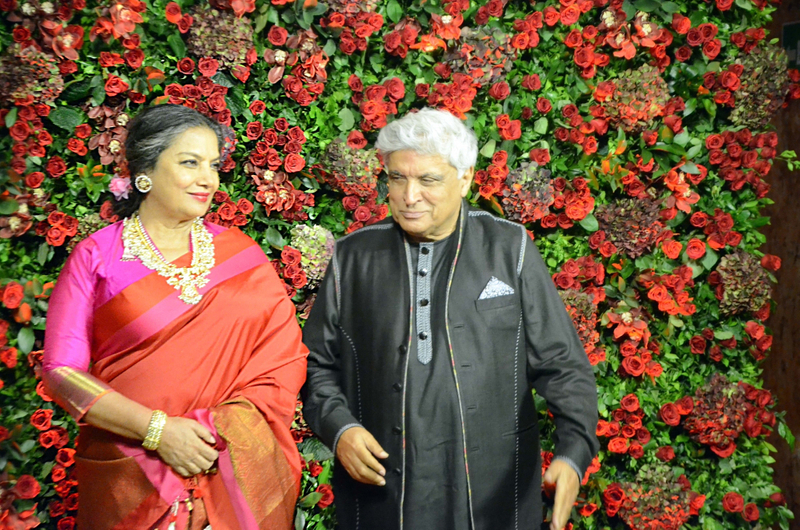 The Bachchans were also a part of the guest list, along with South Indian star Madhavan. Actors including Lara Dutta along with her husband Mahesh Bhupathi also made it. The list wasn’t limited to the Indian entertainment industry. Stars from the cricketing world including Kapil Dev and Sachin Tendulkar were a part of Singh and Padukone’s big party. 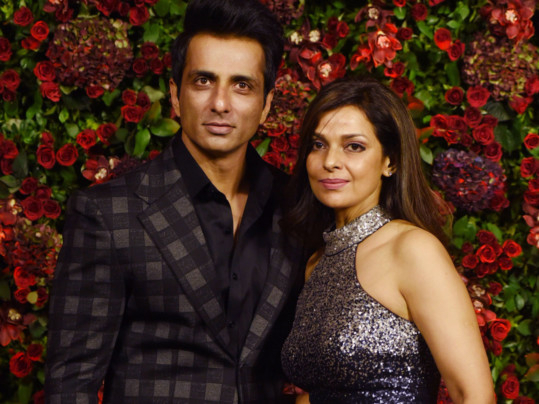 The two Bollywood stars, who dated for six years, tied the knot on November 14 in Italy in a traditional Indian ceremony. But all eyes are not just on Padukone and Singh. In Rajasthan, Priyanka Chopra and Nick Jonas are in the midst of their wedding rituals. Both the actresses posted pictures of their revelry around the same time on Saturday evening, making us wonder if their rivalry on-screen extends to their personal lives too? While that cannot be verified, their fans aren’t complaining as they get to see their favourite stars enjoy one of the biggest days of their lives.